CoLab Radio » Blog Archive » What is the Connection between Happiness and Urban Space? What is the Connection between Happiness and Urban Space? This post is part of Thesis Chronicles where writers share stories and findings from their urban planning research projects. 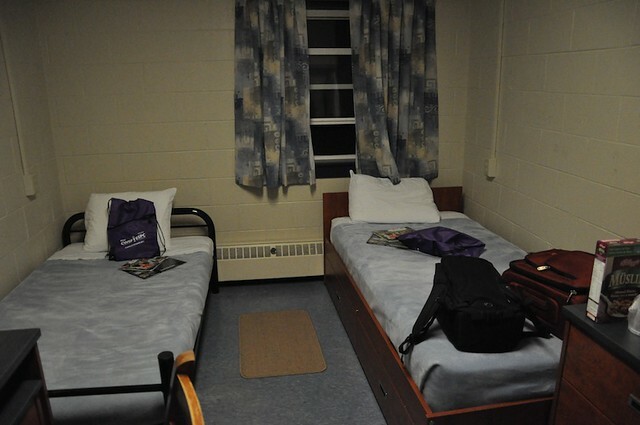 Dorm Room at University of Prince Edward Island. Photo Credit: The Canada Wide Science Fair. I didn’t know cinderblocks mattered to me until I was hundreds of miles from home. During the summer between 7th and 8th grade, twelve of my classmates and I went on a two-week long school trip to Prince Edward Island (PEI). I was excited. Eager to to take an overnight train, I wrongly expected our journey to the Island to be the height of glamour. I was a terrible Canadian and wanted to learn more about my country and I was thrilled to spend time with my friends, unencumbered by a nagging need to do homework. Back then, my favorite part of any trip was settling into the hotel upon arrival, establishing a safe home base from which to then go out on adventures. This time was different. We were staying in dorm rooms at the University of PEI, abandoned by students as they pursued summer jobs and cottage lives elsewhere. Our rooms, and the buildings as a whole, were products of 1980s functionalism. They were comprised of oily white walls, horizontal windows, low ceilings, and cinderblocks on three sides. I recall walking into this clean, perfectly fine seeming room, best friend at my side, and feeling any joy I had drain away. It was sterile and sad. It was both cramped and hollow. I could tell, instinctively, that it hadn’t been designed with any human in mind. I felt helpless, because I could do little to control my surroundings or to retreat to anywhere familiar. Two weeks started to feel long as hell. In a fit of desperation, I tore up a magazine I’d brought, taping pages to the wall to bring inches of color and personality to the space. This anecdote is such a benign one; many people spend their whole lives in rooms like that. I bring it up only because it was my first inkling that happiness—ephemeral or enduring —had a direct link to space and place, and that I was deeply affected by their interaction. This link honestly doesn’t occur to most people—and why should it? Happiness today is inextricably intertwined with consumption and with self—how much money you have, how much property you own, how thin you are – and not with one’s environment. Indeed, the “happiness industry” is now at $10 billion, largely dedicated to selling books and signing up seminar attendees. Today, happiness is trite. Practically speaking, this translated into living virtuously by participating in the city-state. The site of this engagement was the agora, the city square where people exchanged goods and ideas. Here, happiness stemmed from participating in public life in the plaza. Closer to home in time and space, Thomas Jefferson swapped out “the pursuit of property” for “the pursuit of happiness” in the Declaration of Independence. Any history nerd can tell you that this wasn’t a slip of the quill. The two concepts were linked; citizens’ freedom and sense of personal fulfillment were tied to owning land. Any urban planning nerd could also tell you that space and psychology became even more intertwined as “urban planning” became a profession constructed around organizing cities. When it started in Chicago at the turn of the 20th Century, urban planning meant figuring out behavioral responses to the ever-growing metropolis, and how this new, bigger, smoggier form of settlement made people act and feel. I decided to pursue a Master in City Planning because space and its effect mattered to me, and I wanted to develop a language to talk about that. Not incidentally, I had also struggled through bouts of crippling anxiety and depression, something that I couldn’t put a name to or salve on for years. I emerged from that particular sort of paralysis with just enough anger at the fact that not talking about mental health makes it harder to get better; no name often equates to no salve. So through my heightened reactions to space – as with the cinderblocks at University of PEI – I saw a way to use my innate sensitivity and burgeoning professional knowledge to talk about one iteration of psychology in a more accessible way. Whether we are itinerant, homeless, a renter, an owner, or a couch surfer, fundamentally what we all share are places that make us feel certain ways, even if we aren’t initially aware. Though space, be it a room, a plaza, or a city, is never going to be the only thing that determines enduring happiness, it can be a critical factor. With a shoulder mount and Canon in hand, I took to the concrete tunnels of MIT to learn more, using my thesis to make a film about this interaction between space and happiness.